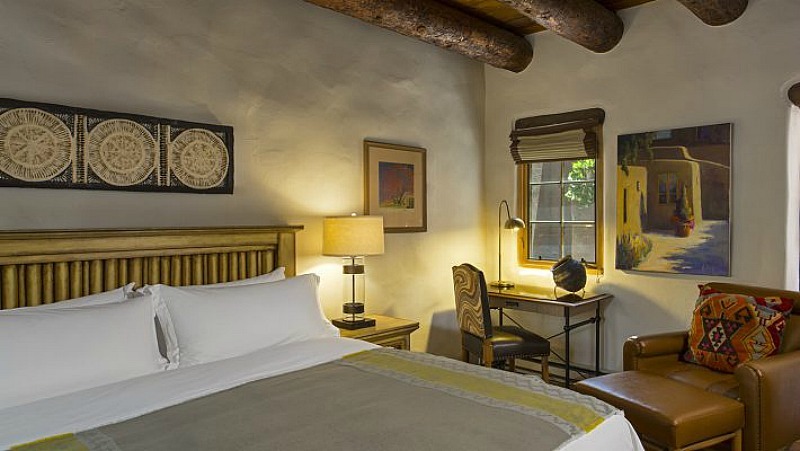 La Posada de Santa Fe is an art-centric four diamond luxury hotel that makes a great introduction to Santa Fe, aka “The City Different.” With a festive atmosphere, over 600 works of art, and cozy rooms with fireplaces. 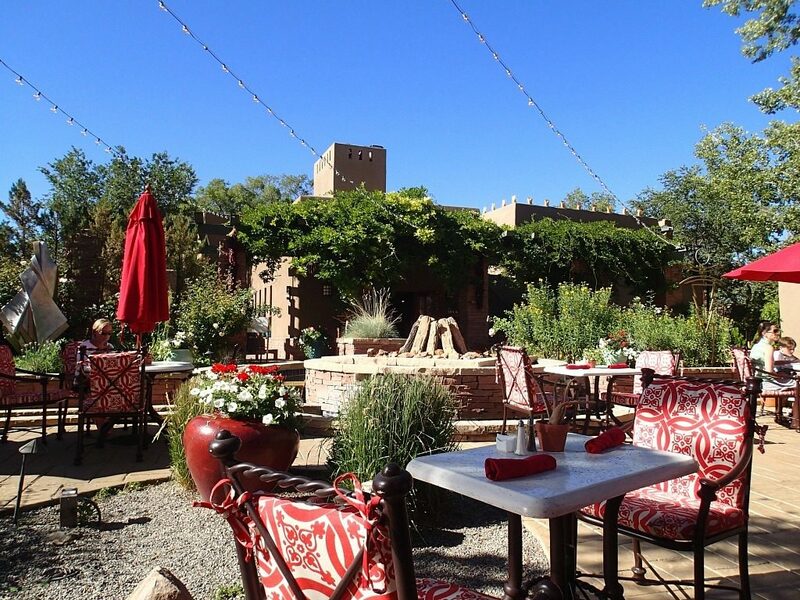 this historical property is located just a couple of blocks from the Plaza and gallery-rich Canyon Road. When it’s too far to walk, complimentary SUVs are available to give you a lift, making this a great hotel choice for those coming up from Albuquerque on the train like we did. Any time I can ditch a car, I’ll do it, and I really appreciate a hotel that makes that easy for me. My favorite part of this hotel is the patio. That, to me is the superstar of this property. There are bistro lights overhead, a fire pit, and bright red umbrellas. At night it’s just as awesome, if not more so with the fires going. I recommend breakfast at La Posada. 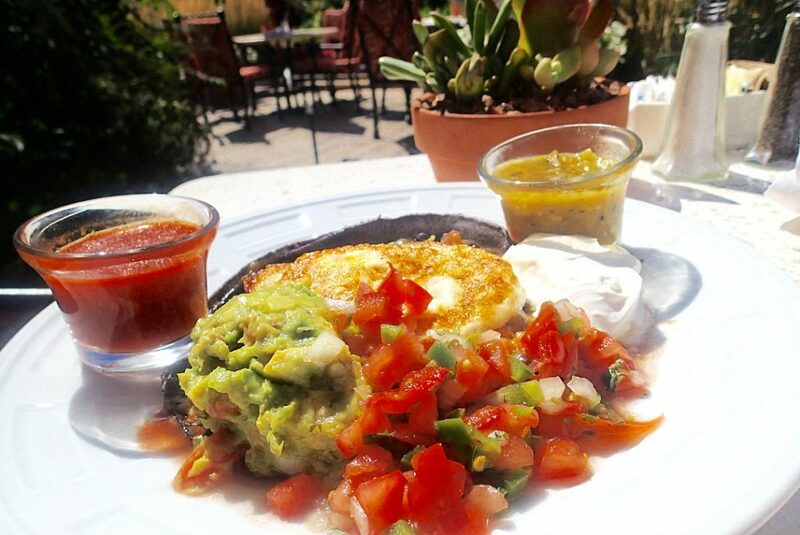 Breakfast on the colorful patio is the perfect way to start your day in Santa Fe. 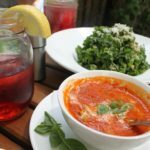 The Huevos Rancheros and Buttermilk Pancakes are both fantastic, and if you order your huevos Christmas style, you’ll get both red and green salsa. 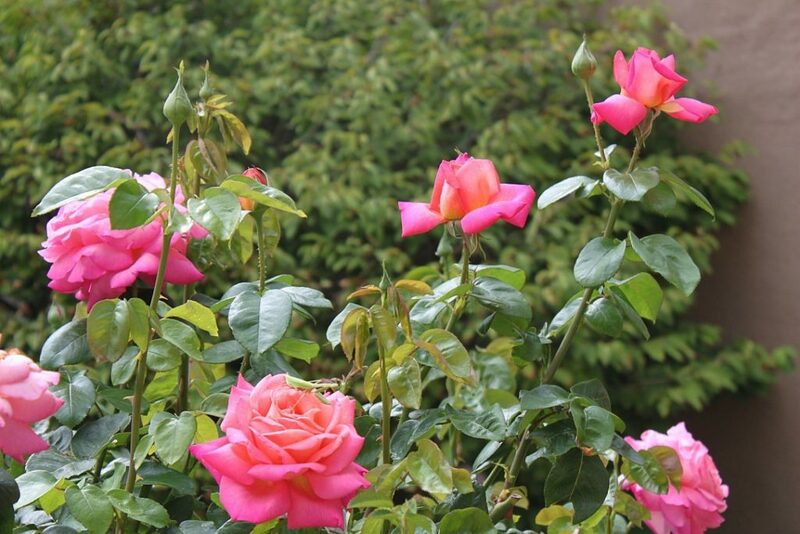 The patio is lined on one side with bright pink roses. They are so bright they’re almost neon, and they smell wonderful. Santa Fe has an elevation of 7000 ft. If you’re having difficulty adjusting, La Posada offers an Altitude Adjustment massage at the spa, or you can pop in for some oxygen and chlorophyll drops that help make you feel more comfortable. For a more decadent treat at the spa, try the Chocolate Chili Wrap and Massage. It’s just what it sounds like—they wrap you up in a dark organic chocolate-chili mixture and let the antioxidants do their job before following up with a coco butter massage. 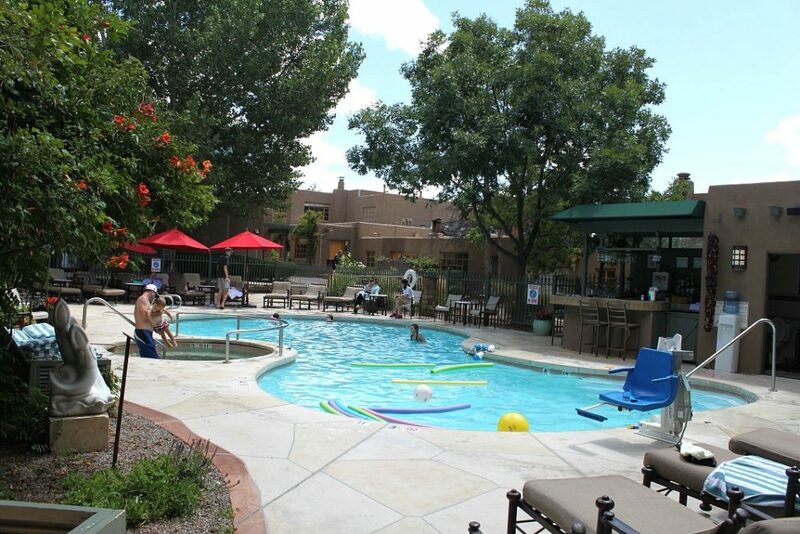 At La Posada, you have diverse room options to choose from. 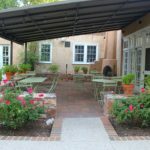 You can stay in the Victorian part of the hotel which was formerly part of the historic Staub House, or you can stay in one of the casitas that were once built to host artist guests, or one of the more contemporary rooms. 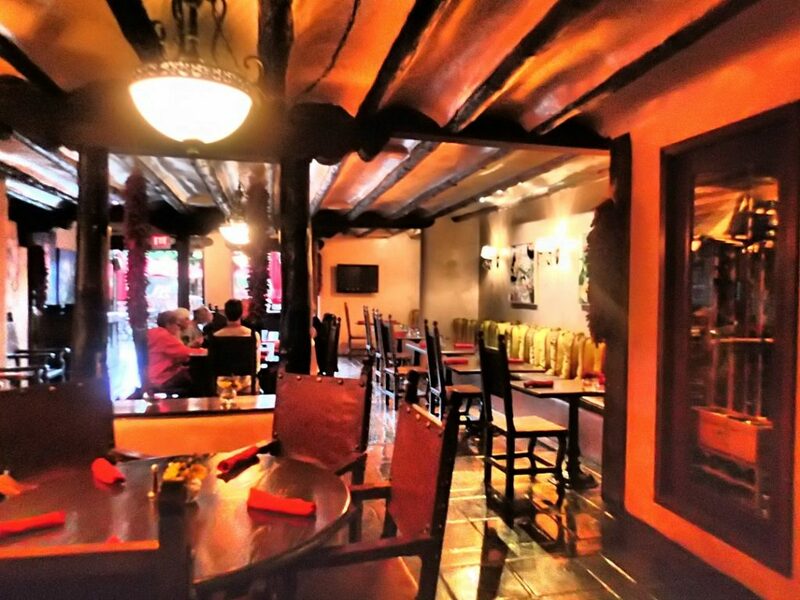 No matter which you choose, you’ll have a fireplace, plush furnishings and colorful art. Every piece of art you see is for sale. 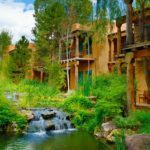 This hotel definitely captures the mood of Santa Fe’s artful spirit. And speaking of spirit–like many hotels in town, this one has a ghost legend. 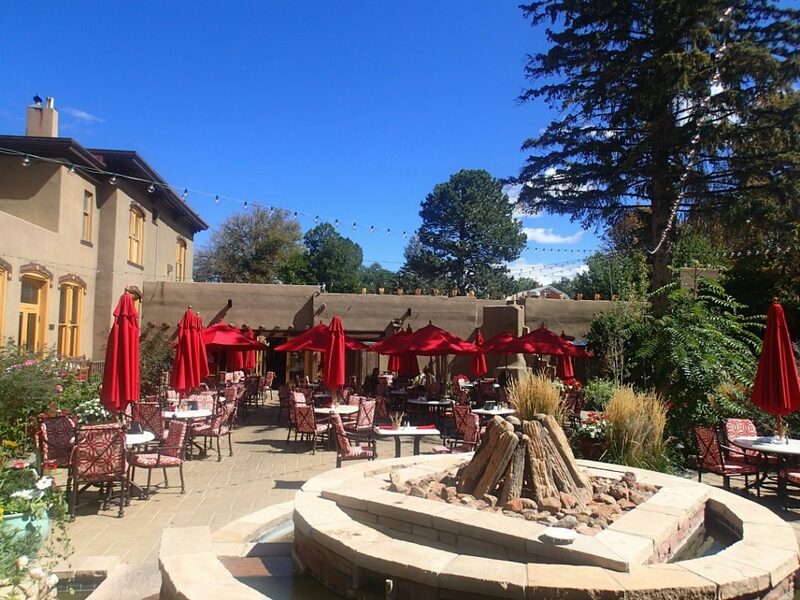 It’s said to be haunted by the ghost of Julia Staub and if you stay at La Posada, you’ll hear stories about her antics and likely speak to staff who claim to have seen or felt her presence. Believe it or not, we did not hang out at the pool. That’s unusual for me because I love swimming. 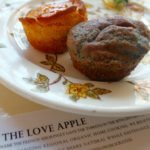 The location was so perfect for getting to know the Plaza, that we opted to visit the Children’s Museum, Georgia O’Keeffe Museum, and the little shops and galleries along Canyon Road and in the square. The pool is beautiful though, so next time I will make a point of taking a dip. 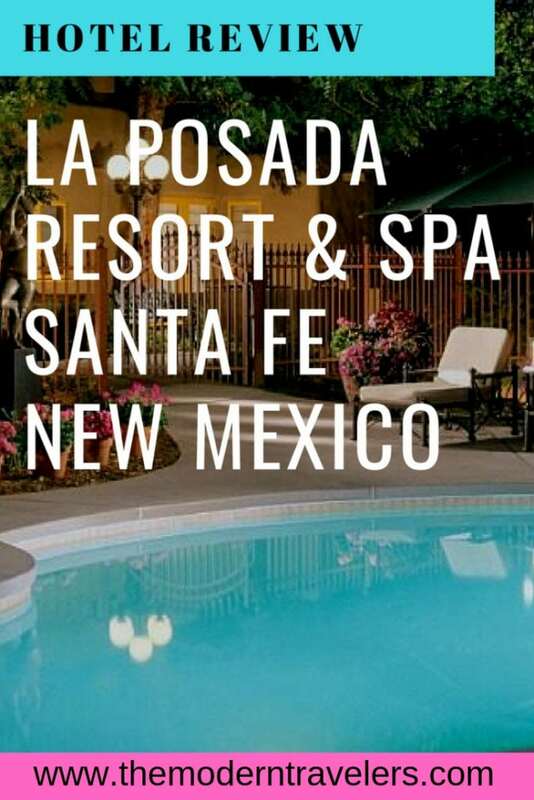 La Posada is an excellent choice for accommodations in Santa Fe. It’s a beautiful property with luxury amenities and unique historic surroundings. The location is perfect for exploring the town and offers easy access to the Plaza where you can stroll, shop, and find great places to dine. The spa offers oxygen and chlorophyll and they will go out of their way to make sure you are comfortable during your stay. Don’t miss breakfast on the patio! Find out more on the website. Image 1+5 courtesy of La Posada. We were guests of La Posada, opinions are my own.